IBA Centre for Excellence in Islamic Finance (IBA CEIF) is pleased to offer two-day intermediate level course on Risk Management. 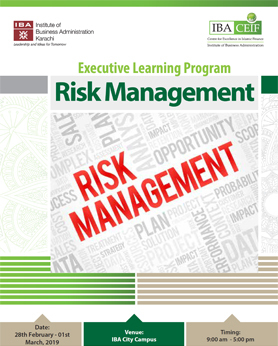 The course sets out the concept of Risk management in Islamic Banking and then moves on to the practical aspects of applying it with demonstrations from case studies and interactive exercises throughout the program. The underlying IFSB guidelines for each risk will also be discussed. The course is designed to apprise the participants with product risks, enterprise risk, operational risk and market risk along with mitigants of the said risks.